You can see that Rob’s been a busy bee. 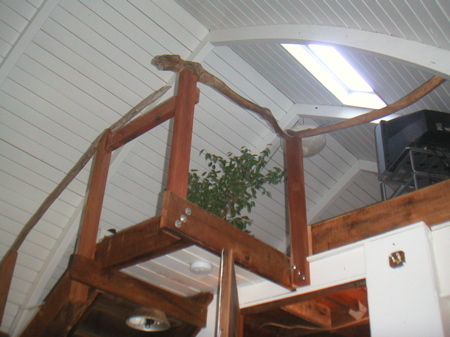 He found two pieces of driftwood and some redwood (the house, including the staircase, is made of redwood) and Suzy proofed the loft over the past couple of days. If I can ever sleep upstairs again, it will be good to know that it’s unlikely I’ll roll off. Once was more than enough, no matter what Jacqueline Susann says. I’m slowly improving, but still can’t sleep in my bed. For some reason, lying down riles up the bruises on the left and the rib-related injuries on the right. I tried again last night, but ended up dragging my pillows and blankets back downstairs. I propped them up on the couch, where I slept like the Elephant Man for the fifth night in a row. I now fantasize about sleeping on my side in my bed instead of having dinner with George Clooney in Venice. How the mighty have fallen. Both literally and figuratively. Now that Rob has Suzy proofed my house, he’s going to help Jonathan bear proof the bees, building an electrified fence around them. While they’re doing that, I’ll start reading “Beekeeping for Dummies”. Will Calamity Suzy and bees be a bad combination? Stay tuned! I’m sure that once you are healed – you will have no trouble going up to bed….. You had a big tumble, so be patient… Also, you know what they say about falling off a horse?…………..you just have to get up on it again. An amazing amount of bees. I never thought about the bear aspect….wow1 Is this hive situated very far from your house and all the others? What an interesting occupation. 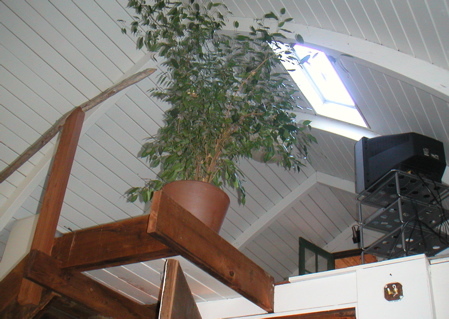 Hope you get to sleep in your own bed soon, I like the drift wood idea, fits so well in your country home surrounding, I always loved a loft, don’t be so hard on yourself, accidents happen, cheers. 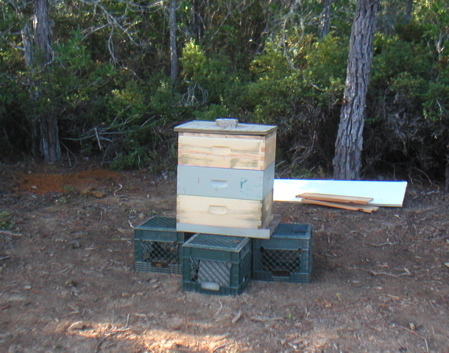 The hive is over at my brother’s place, on the 30 acre property. You can see it from his house, but it’s not too close. Finding the right spot with sun yet shelter was a challenge! There’s a lot to learn. You fell from THERE? Holy moses, girl. You’re lucky to only have bruised ribs, I think! That had to seriously, seriously hurt. And scare the bee-jesus out of you. Keep us posted on the bees! That is so cool!